Visit the home of William Shakespeare and see where the legendary playwright was born, grew up and later lived with his wife Anne Hathaway. Shakespeare’s Birthplace in Stratford-upon-Avon has been open to visitors for over 250 years; letting fans of the Bard explore a home steeped in literary history. Famous visitors to Shakespeare’s home include Charles Dickens, John Keats, Walter Scott and Thomas Hardy! 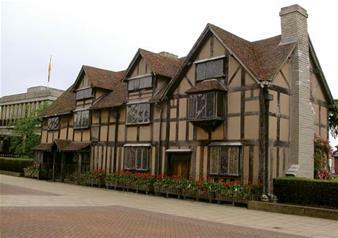 Walk through the half-timbered home and see where Shakespeare ate meals, slept and spent time with his family. During your visit to Shakespeare’s Birthplace, you can also experience the introductory Shakespeare Exhibition. Find out how the boy from Stratford-upon-Avon became a household name all over the world! The exhibition features a selection of Shakespeare memorabilia, artwork and a copy of Shakespeare’s First Folio.